North Devon must be one of the most pro-active fundraising and community led regions in the country. We’re so proud of you all and we’d love to help you. Each week we’re contacted by local charities and individuals looking to raise funds for local and global good causes and each week we do our best to support you all in your worthwhile endeavours. It was one of the fundamental reasons why The Voice was created. So why not send us information about your fundraising event and we’ll include it in our events calendar and back you up with some social media support. 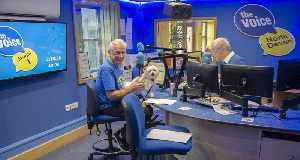 This is Paul Jewels and Gozo who came in to the studios to talk about the work Gozo does for the Pets As Therapy Charity. So, if you’re a local charity, send us a press release and we’ll hope to email you back with an opportunity to come in to the studio for an interview. Again, our in-house events and marketing teams will support you with social media and event co-ordination. Here's Peter Little from Braunton Caen Rotary Club. Peter came in for an interview with Hopps and Chapple looking to raise awareness for a fundraising evening the club were holding in aid of Shelterbox. The fundraiser included a Mediterranean dinner at the Broomhill Art Hotel with a guest performance by singer songwriter Jim Crawford. We’re very pleased to announce that the fundraiser not only achieved its target to raise funds for one Shelterbox, but actually managed to raise enough for two boxes which are now on their way to families in great need.